oTENTiks; give visitors the opportunity to rough it while still enjoying some of the comforts of home, while vacationing in the Columbia Valley! 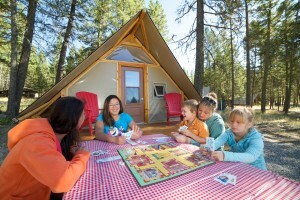 oTENTiks; Located in Redstreak Campground high on the hill above the Village of Radium Hot Springs, is the perfect location for families to relax, unplug and enjoy spending time outdoors. Ten 6 x 7 metre (19 x 24 foot) tent-cabins, known as the oTENTiks are available to rent between May and October. These oTENTiks give visitors the opportunity to “rough it” while still enjoying some of the comforts of home. Located within walking distance of the Village of Radium and the Radium Hot Springs pools, the oTENTiks in Redstreak Campground provide the ideal mix of camping and outdoor adventure. Wake up to the sounds of nature, take a dip in the hot springs, explore some of the nearby hiking trails, enjoy dinner at a local restaurant or cook a traditional meal over the campfire. Don’t forget to join the Parks Canada’s interpreters for an evening program at the campground theatre. However, you plan to explore the Kootenay National Park and the Village of Radium Hot springs, Parks Canada’s oTENTiks make summer camping easy.